All men use stories and images to converse with the world, which is largely invisible and unknowable. These stories and images do not necessarily have to correspond to this unknowable reality. As long as they produce some effect, they will be used. This is what art and science have in common: the development of new forms to converse with reality in order to be able to survive more easily and more comfortably. In both cases, the basic problem is finding strategies to make the jump from our body of existing knowledge to new insights. As Thomas Kuhn wrote, these jumps probably occur during our sleep. When I first met Maarten Vanden Eynde, I was struck by the beauty of his sculptures, but also by this strange collection of images pinned to the studio wall and arranged according to old and newly invented sciences. Some patterns in the images on the wall matched patterns within the sculptures (e.g. the wooden sticks imitating antlers and the repaired cracks in the French lake). I sensed a joyful faith in the miracles of form, as wondrous links with the outside world. I call this faith joyful, because it was obvious that the artist recognized and savored the hypothetical nature of his construction. I know a lot of artists who juggle with theories to arrive at new images, but very often they take themselves so seriously that one feels pity. I must admit I prefer this artist’s playful approach to the wonders of our interaction with the world. Vanden Eynde’s reasoning is the following: what if everything I did was not part of a dying past, but the beginning of a bright future? What if the object I am making at the moment is the only object which in 2,000 years’ time will be left over from our civilization? In that case, every object can be seen as sacred. And funny. Because from that moment on everything Vanden Eynde creates might also be seen as a potential witness of the stupidity, tastelessness or mere absurdity of our culture. And all his sculptures comment on our own way of dealing with the past and extracting stories from it, based upon some accidental findings. For example, Maarten Vanden Eynde breaks an Ikea cup and tries to mend it, or travels to Rome to bury an artifact on an archaeological site. Thus he discovers authentic footprints of a Chihuahua in Los Angeles, dating from the year 2008, and tries to preserve them for humanity. Basically, he turns upside down our historical way of looking at things by pretending to predict what will be left of our society in the future, and he does so without ever forgetting the absurdity of his undertaking. These days the idea that history is always a construction of the beholder, is generally accepted. Truly objective history doesn’t exist. We don’t know what happened in the past, we don’t know what’s happening in the present and we surely don’t know what will happen in the future. But as long as we stick to Socrates’ adagio never to forget that we know nothing, we can continue to embrace the world with an open mind and perhaps even learn something. Vanden Eynde’s Genetologic Research is divided into different chapters, which correspond to different traditional sciences (and some new ones). 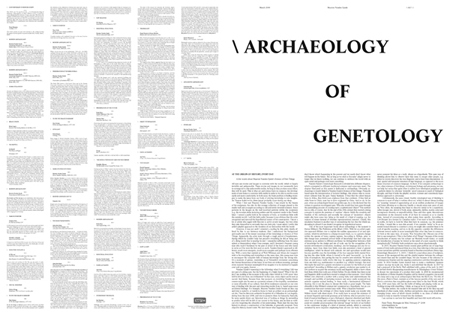 The chapter illustrated on this poster is dedicated to archaeology. Obviously, archaeology is closely linked to Vanden Eynde’s Science of first things. Primarily based upon the interpretation of isolated findings, this science tries to reconstruct cultures from the past. Funny business. If they find the oldest human bone in Africa, they think man originates from that continent. If they find an older bone in China, man has to have originated in China. And so on. In the past, when an archaeologist found one golden ape, he or she declared that the culture in question worshipped apes. Why else would they have gone through the painstaking process of creating such a sophisticated object? This method was so silly, of course, that by the end of the 20th century they started coining concepts to explain the presence of “random” objects: firstly the creativity and freedom of the craftsman and secondly the concept of “emulation”: objects might also have come into being as the result of a kind of copying, e.g. for reasons of status (instead of absolute representational reasons). Clearly, this emulation business is another way of rationalizing the fact that the whole undertaking is absurd if one doesn’t recognize its hypothetical nature. One of the most important books about archaeology at the moment is Steven Mithen’s ‘The Prehistory of the Mind’ (1996). With his so-called cognitive approach Mithen tries to explain the sudden appearance of art and agriculture, which he attributes to a change in man’s brain, i.e. to a genetic change within the species of homo sapiens sapiens. According to Mithen, prior to this change man possessed several fields of knowledge that had come into existence as an answer to different problems: he distinguishes between a field of knowledge for the design and use of tools, one for the recognition of the natural environment (orientation, tracking), one for language and one for socializing. Apart from these four fields, man also possessed a kind of general intelligence, which he shared with animals. Art and agriculture would have become possible once the knowledge of the four separate fields started flowing into the other fields, where it started to be used “incorrectly”, i.e. in the form of metaphors, thus paving the way for creative new solutions. 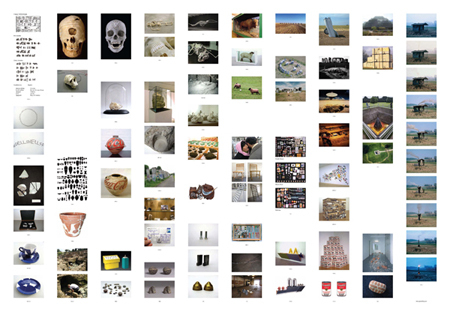 We know that art and science really evolve this way: by applying patterns originating from one field (e.g. mathematics) to another (e.g. cellular biology), but does this imply the need for a genetic revolution to account for the birth of art and agriculture? According to Mithen such a genetic revolution was needed to allow mothers to acquire the necessary social and linguistic skills to have others feed them whilst they took care of their babies. He also thinks that these social and linguistic skills would have started to mingle at that moment. I don’t think Mithen ever observed a mother with a young baby (and underestimates the strength and mobility of nurturing women) and never really wondered how animals organize mutual feeding. Is there really a fundamental difference? Anyway, this is not the place to discuss this book at great length. The basic absurdity is that Mithen’s attempt isn’t presented as a hypothesis, but as a reconstruction that must contain some truth. What a hopeless business! One look at the writings of Oliver Sacks would make you wonder why Mithen doesn’t talk about music. If we really have to accept the existence of an innate linguistic and social grammar, as he believes, why not perceive it as a kind of musical intelligence or just a biological, chemical, electrical and rhythmical way of storing and combining knowledge? At some point Sacks proposes we consider proprioception (the internal “image” we have of our bodies) as the continuous singing of a kind of internal melody, which is constantly sustained by nerve impulses originating from all over our body. However, he never presents his ideas as a truth, always as a hypothesis. This open way of thinking allows him to observe facts that seem to escape other people, e.g. when he slowly discovers the true linguistic and at least four-dimensional, visual, spatial and temporal structure of sign language, as opposed to the more linear structure of common language. In short, if we compare archaeology to two other sciences of first things, evolutionary biology and astronomy, we cannot help but notice that quite often it suffers from teleological prejudices and a pathetic desire for absolute “scientific” proof common to much of biological thought, and that it lacks the playful, modest, tolerant and consciously hypothetical approach of astronomy. Unfortunately, the same closed, fearful, teleological way of thinking is common to most of what is written about art, which is almost always looking for “meaning” instead of appreciating art as an endless production of images and forms allowing us to discover, handle or simply enjoy new parts of reality. Very often, the meaning they hope to discover seems to be a superficial, rather meager one, devoid of body, sense, sensuality, rhythm, matter, color and incongruous diversity or unpredictability. Time and time again, theoreticians concentrate on the elements works of art have in common so as to classify them, instead of concentrating on what makes them specific. According to Lévi-Strauss (in a lecture for Canadian radio), if we want to look for meaning in myths, we have to look for what they have in common, e.g. the presence of twins. I would like to turn this around. If we consider “twins” to be an essential formal element to construct a story, we might also consider them to be void of specific meaning, and try to do the opposite: consider the differences between several myths as more meaningful than what they have in common. Or both at the same time, of course. Was Heraclitos the Obscure one of the first to use metaphors (“Fire is the Father of all Things”) because of the recent introduction of money into his culture (as Marxists would claim), or could the introduction of money be viewed as the result of a new capacity to think metaphorically? Probably both evolutions came about simultaneously. In 2003, Maarten Vanden Eynde created giant pebbles out of large fragments of brick walls and placed them in a river, thus referring to the man-made stones turned into pebbles currently found on beaches everywhere (Stone Age, Genetologic Research N° 3, 2003). I think it’s a marvelous piece of sculpture, because of the unexpected size and the playful tension between the orthogonal cement lines and the rounded shape, but also because of the reference to contemporary beaches and the ongoing construction activities throughout the world. In 2004 Vanden Eynde learned how to make a traditional Japanese ceramic tea-cup; he made one, broke it and exhibited the shards. In 2007 he had a postcard of the Berlin Wall exhibited with a piece of the wall. In 2007 he invited slowly disappearing manufacturers in Birmingham (Great Britain) to donate two specimens of a product they made. In 2008 he reconstructed the skeleton of Homo Stupidus Stupidus and he showed a negative clay mould of a lamp and a cup as an archaeological find from the IKEA era. The title of this piece, ‘Plato’s Closet’, reminds us of the famous parable of the cave and of Plato’s conviction that non-philosophers were blind to the Real World, which now, 2000 years later, still has the habit of hiding and playing tricks on us. Nothing wrong with stumbling, I think, as long as we do it graciously. The fake antlers, the cracks in the repaired lake and in the Ikea cup and hundreds of other cracks, folds, rhythms and patterns, sing a song of endlessly changing forms, some of which remain invisible to us, some of which were created to help us stumble forward into the darkness. I am curious to see how this beautiful and heart-felt work will evolve.